a planetary conjunction, a supernova, an asteroid, a meteor or an unidentifiable object. Earth's annual orbit is The Master Clock because the common yardstick of our lives is the year. Years are divided by the seasons just as calendars are segmented by months. Mechanical and digital timepieces measure intervals that split into hours, minutes and seconds each spin of our planet on its axis. Yet, it is the earth's regular, rhythmic loop around the sun that standardizes our timeframe of reference, regardless of geographic distances separating us from our acquaintances or generational distances separating us from our ancestors. Our planet moves around the sun in an elliptical circuit deviating less than a second from one year to the next. Together we proceed through 8 significant, yet invisible, thresholds within each orbit. These spatial milestones mark the beginning, midpoint and end of each of our seasons. Equinoxes, Solstices and Cross Quarters are moments shared planet-wide, defined by the earth's tilt and the sun's position on The Ecliptic along 45° arcs. To ancient civilizations fascinated and entertained by the cyclical motion of the heavens, the ability to fix these cusps just to the nearest day was highly-prized, even sacred knowledge. With modern measurements and calculators much better accuracy is possible for determining these moments. This Grand Octal in the sky is largely ignored by most modern societies. 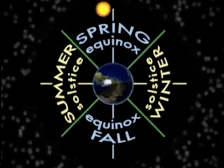 Equinoxes and Solstices have become little more than footnote mentions on occasional weather reports. Cross Quarters are all but forgotten, in spite of having been observed and celebrated for centuries by Celtic people. Archaeoastronomy.com revives a tradition of marking the eight primary seasonal divisions within our common year. See time tables for our planet's orbital milestones. Archaeoastronomy's goal is to understand how skywatchers of the past fashioned and refined systems for regulating their primitive calendars and for memorializing celestial events, both cyclical and unique. Often they relied on sunlight and shadow plays striking and passing across targets and designs aligned with the Grand Octal. Sometimes the celestial cycles of the moon, Venus and Mars captivated their attention, too. However, knowing seasonal durations and transitions was vital to success in hunting migratory prey, planting crops and harvesting them. Archaeoastronomy draws on several scientific disciplines, primarily astronomy, archaeology, anthropology, psychology and epigraphy, the decoding of ancient inscriptions. For the fundamental orbital mechanics that allow Earth to experience the seasons it does, see seasons reason. Astrology, scorned by today's technology-driven science, was integral to humankind centuries ago. Certainly, for research to yield credible results, the modern scientific method is essential. Nonetheless, myth was as dominant in ancient times as mindless mass media is now. Aren't both merely comfortable proxies for what's real? To diminish the contributions of illuminated minds of the past who shared neither today's tools nor perspectives is to exhibit an arrogant, technocentric bias. Those authorities who tend to devalue legacy historical perspectives are only stoking the fires for the inevitable cremation of their own triumphs by a revisionist generation, of greater wisdom and superior perspective, in the future.